My good buddies over at ProTone Pedals are giving away a free Rusty Cooley Overdrive to one extremely lucky person. Head on over to THIS LINK to sign up. While you’re there, don’t forget to check out the ProTone blog at blog.protonepedals.com. The all analog design offers a smooth overdrive and huge volume boost along with treble and bass controls to add brawn and flexibility to your tone shaping possibilities. Designed to push already high gain tubes into a new realm, the Rusty Cooley overdrive does so without coloring your tone, adding a ‘mid hump’ or making your top end shrill. CLICK HERE to buy the pedal direct from ProTone or to see video of Rusty himself demonstrating the pedal. ProTone Pedals have expanded their relationship with Dean endorser and unstoppable shredding machine Rusty Cooley to include a new signature overdrive pedal. Rusty recently helped the company out during the prototype phase of their Jason Becker Perpetual Burn distortion pedal. I haven’t played one yet but I hear from those who have that it’s freaking amazing. World renowned guitarist & instructor Rusty Cooley and cutting edge guitar effects manufacturer Pro Tone Pedals join forces to create an overdrive pedal designed to operate under the highest of gain situations. Rusty is a frequent columnist in all of the major guitar magazines and is consistently named one of the top shredders of all time. Rusty continues to build a rabid following of tomorrow’s shredders with his wildly successful instructional DVDs, his progressive metal band Outworld, and instrumental solo CD. The all analog design offers a smooth overdrive and huge volume boost along with treble and bass controls to add brawn and flexibility to your tone shaping possibilities. Rusty will be demoing his signature pedal at the Pro Tone Pedals booth at this years NAMM show. For a schedule of appearance times visit ProTone Pedals online or http://www.rustycooley.com/. 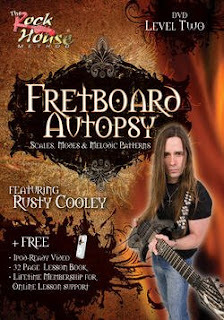 CLICK HERE to buy Rusty’s Rock House Fretboard Autopsy- Scales, Modes & Melodic Patterns, Level 1 DVD. CLICK HERE to see Dean guitars on eBay. Rock House announced the release of two instructional DVDs featuring Rusty Cooley, one of the most popular and technically proficient guitar players of this generation. The new products titled Fretboard Autopsy Level 1 & level 2 has Rusty teaching his unique approach to fretboard visualization through shapes, patterns and years of model knowledge. In Level 1 Rusty shows students how the modes are covered across the neck, 5 and 6 string root modal patterns, extended and split patterns, single and double string techniques and more, In Level 2 Rusty unlocks the road map that gives guitar players the freedom to improvise over the entire fretboard without being locked into positions. Learn 4, 5 & 6 string root modes, extended patterns spanning the neck, 3 octave modes, reverse linear patterns and modal sequences. Rusty shows you how to create modal chord progressions for each of the 7 modes and more. Rusty was named one of the Top 20 Most Blazin’ Shredders of all time by Total Guitar Magazine and his Shred Guitar Manifesto has been sited as having influenced John Petrucci and Mark Tremonti. “Rusty Cooley is certainly at the fore front of pushing the boundaries of modern guitar playing.” Said Joe Palombo, Executive Director of Rock House.